The Solar Heat Pump hot water system has two heat ex-changer coils inside the tank, one of the coils is connected to the solar collector, the other to the heat pump. The coils use glycol as the heat transfer fluid. The solar circuit system has its own pumps and controls to ensure that a maximum of solar energy is utilized for heating water and the auxiliary heating source turns on automatically to ensure hot water in the storage tank at all times. The solar thermal storage tank restricts the capacity available for the next day unless auxiliary electrical heating is used. To improve hot water availability, Scanair water heater manufacturers have developed a hybrid system called solar heat pump a combination of a pumped solar system and a heat pump, which is suitable for large homes with hot water demand for multiple applications. The tank water is heated either by the solar collector or the air-to-water heat pump. the PLC temp controller decides automatically which power source Solar or heat pump will be used. Optionally, the system comes with a device to measure electricity consumption. The installation is designed for both new builds and building retrofits. It is available in sizes ranging from a capacity of 500 litres to 5000 litres per day. The heat pumps have an electric power output of between 1 Kw to 12 Kw. Scanair hybrid solar heat pumps are the most power efficient system it consumes one tenth of electric geyser power on the sunny days with 500 litre tank capacity, electricity cost-saving calculation was made in tropical condition, which can deliver up to 1600 litres per day. The basis for calculation was the provision installation requires 1.2 kwh per 100 litres of hot water which means that the benchmark electricity demand is 20 kw per day. The same requirement of 1600 litres of hot water per day would consume 60kwh of electricity when provided by an electric element alone. Using an air-to-water heat pump reduces electricity demand less than 20 kwh. Therefore calculating the savings – 20 kWh from solar and 40 kWh form the heat pump- the hybrid system brings daily power consumption down by 50 kWh per day. At an electricity price of 7 INR kWh this means INR 350 saved each day. Assuming 300 operational days per year, the figure even adds up to almost INR 10,5000 an attractive option for property owners. 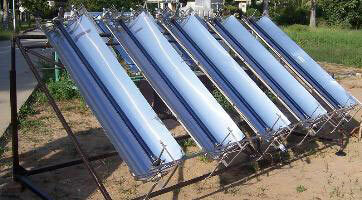 Solar drying is in practice since the ancient time for preservation of food and agriculture crops. 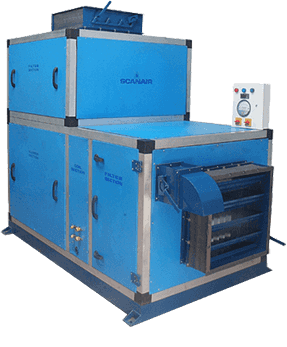 The objective of most drying processes is to reduce the moisture content of the product to a specified value. Solar heat pump dryers used in agriculture for food and crop drying and industrial drying process can be proved to be most useful device from energy conservation point of view. It not only save energy but also save lot of time, occupying less area, improves quality of the product, makes the process more efficient and protects environment also. 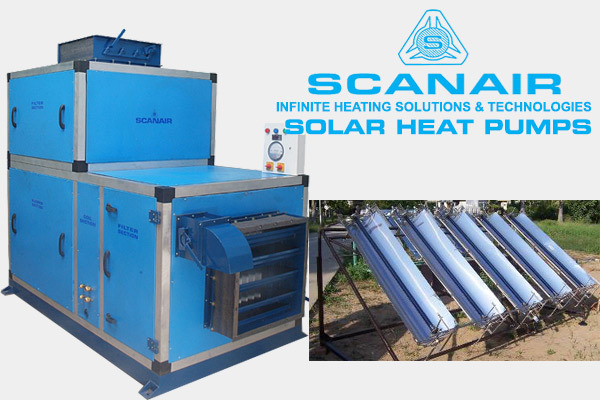 Scanair heat pump assisted solar drying system is an excellent alternative to traditional drying systems. SAHPD systems indicated that the COP of these systems can be much better than that of conventional heat pump dryers and also quality of products has been improved. SAHPD systems with respect to product quality control reduced energy consumption and reduced environmental impact can be very useful. For heat sensitive materials improved quality control can be achieved due to low drying temperatures and independent of the outdoor air. Reduced energy consumption is achieved due to the high coefficient of performance of the solar assisted heat pump dryer and the high thermal efficiency of the dryer when properly designed.